Julian Love at Blizzcon 2010. 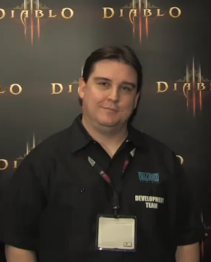 Julian Love is Lead Technical Artist for Diablo III. He works for Blizzard Entertainment in Irvine, California. He's one of the few holdovers from Blizzard North still working on Diablo III, and has deeper roots in the Diablo community than most of the devs with his longevity. "So I run the Technical Art department, and the kinds of things we do there are we build a lot of custom art tools to make production go a lot easier, and we also rig characters which is a way of sort of making them "puppetable", so the animators can define how they’re going to move, and probably the biggest visual contribution we make is through special effects, breakables, and lighting." Slashdot: Could you explain your role on the Diablo 3 team? Julian Love: A lot of people don’t know what a lead technical artist does, or even a technical artist. So, the easiest way to understand it is: all the things that your player does in the game, all the skills that they have, have visuals attached to them, usually done with special effects. That’s really the focus of what my team does that you can see in-game. We are very tightly coupled with the design team to help them visualize and even come up with a lot of the player skills – what they are and what they do. ↑ Interview at Blizzcon 2009. ↑ Interview at Blizzcon 2010. This page was last edited on 10 January 2011, at 05:43.